New Delhi: The country’s economy could grow at a faster pace in 2009-10 compared with the previous year although inflation and high fiscal deficit are major challenges for the government, the finance minister said on Wednesday. Surging food prices and faster industrial growth have pushed up headline inflation, putting pressure on authorities to take steps such as importing food items and raising the cash-reserve ratio for banks and interest rates to check inflation. A 16-year high fiscal deficit of 6.8% of gross domestic product projected for 2009-10 (April-March) increased borrowing needs to a record Rs4.51 trillion and kept bond yields firm this year. “Some of the important issues and challenges in the short-to-medium term include price rises, (and) return to the path of fiscal consolidation," the minister added. The worst monsoon since 1972 and flooding in some parts of the country have pushed up food inflation to near 20% by early December, while the headline inflation accelerated to 4.78% in November. On Tuesday, the government cut the open sale price of wheat, while ministers have pledged in Parliament that the government would import food items that are in short supply to boost local supplies and stem inflation. 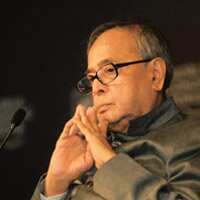 Mukherjee said farm output must grow 4% for the economy to expand 9-10% annually in the coming years. For the government, “sustained economic growth remains a high priority", he said. A series of stimulus measures such as cut in policy lending rate by 425 basis points by the central bank between October 2008 and April 2009, and duty cuts and additional expenditures by the government helped the economy turn the corner from the March quarter. One basis point is equal to one-hundredth of a percentage point. Asked if faster economic expansion could bring forward the time for withdrawing fiscal stimulus, the minister said: “You have to wait till the budget." The economy grew 7.9% in the September quarter, accelerating from 6.1% in the June quarter and 5.8% each in the December and March quarters. The economy expanded 6.7% in 2008-09, slower than 9% or more in the previous three years.